PHILIPSBURG - Winair announced on Monday that due to the imminent passing of Hurricane Irma in the area, all service is suspended this Tuesday, September 5and Wednesday, September 6. The airline hopes to restart limited services Thursday September 7depending on the post Irma conditions. 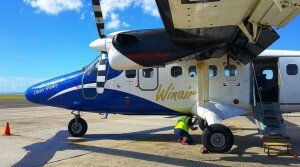 With the unpredictability of Hurricane Irma, Winair will relocate their Twin Otter aircraft to a more secure and safe area in the Southern Caribbean. Affected passengers are presently being contacted for re-accommodation by the reservations department. A storm policy is in effect and customers will be rebooked at no additional cost. Winair apologized for the inconvenience and asked understanding that these weather conditions are beyond their control. The operations of Twin Otter flights to destinations Saba, St. Eustatius, St. Barth, Canefield – Dominica, Antigua, Tortola, St. Kitts and Nevis, in addition to the flights to Douglas-Charles – Dominica, Guadeloupe, San Juan, Curacao and Haiti, will resume once it is safe to do so.